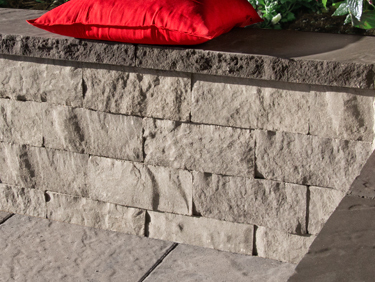 "The Hazelton Wall combines the detailed texture of natural stone with modern engineering and strength. With twelve different surface textures, Hazelton provides a beautiful random finish enhancing your landscape environment. Offered in a variety of colours, the Hazelton locking system works seamlessly with our Garden Lock™ wall system and coping units for creative horizontal banding and accenting."